We take responsibility for our impact on the earth. We recycle, upcycle and are continuously striving to waste less, consume less and need less. 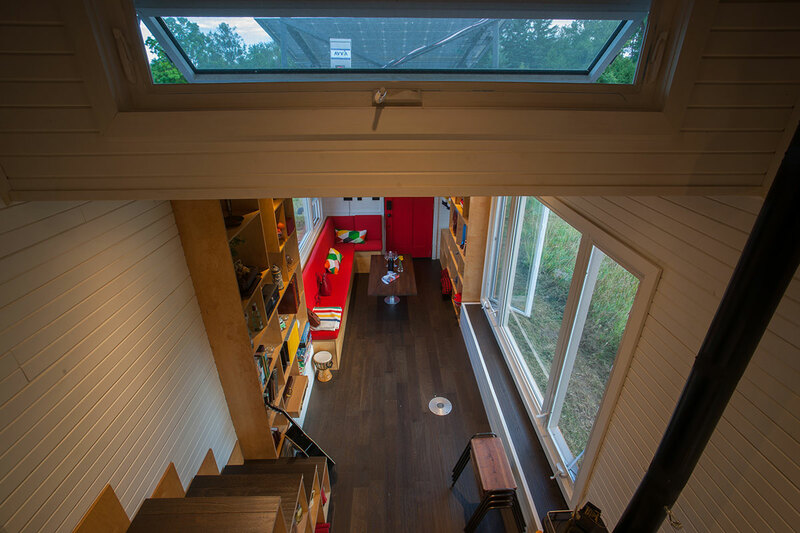 So it’s no surprise that the tiny house movement really ticked all our boxes. 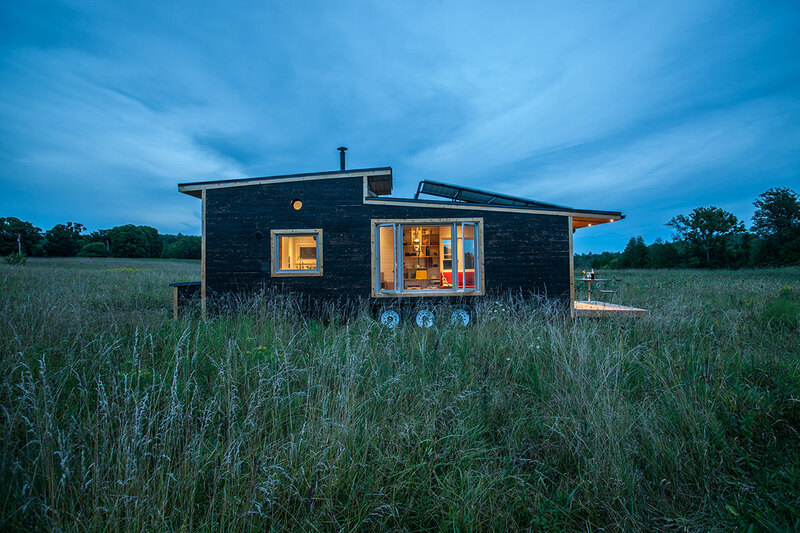 I’m not talking about a tiny house that is essentially a fancy trailer that needs to hook into the grid and sewage system, I mean a sustainable, off-grid, eco-friendly home that is a comfortable place to stay. The idea of living mortgage-free only added to the appeal. 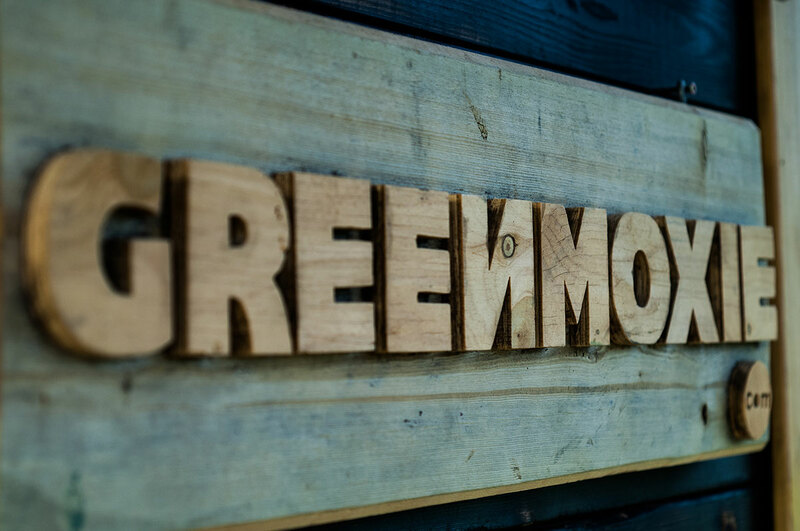 Combining the unique aesthetic of innovative designer David Shephard and the craftsmanship and ingenuity of builder Ian Fotheringham, we set out to build our Greenmoxie tiny house. 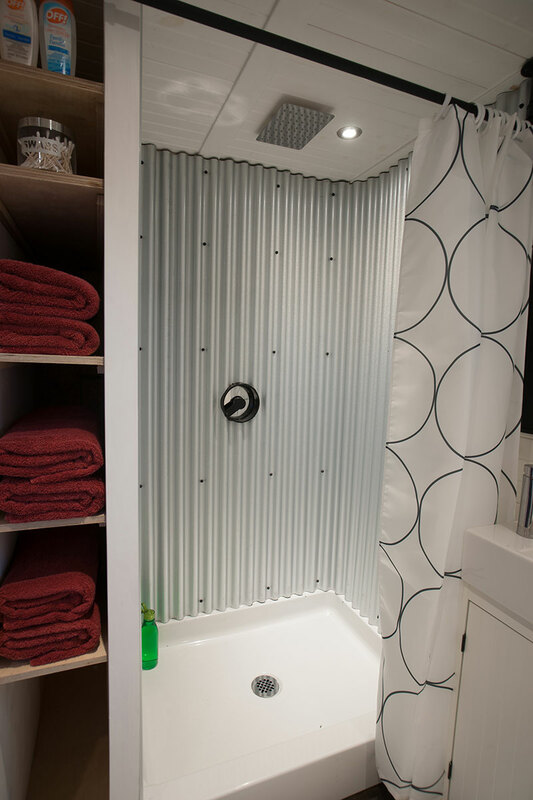 This tiny house in San Juan tiny home is off-grid and powered by solar. Better still, it's made almost entirely out of reclaimed wood. More than 50% of Americans state that they would definitely consider living in a home of less than 600 square feet according to a recent survey conducted by the National Association of Home Builders. 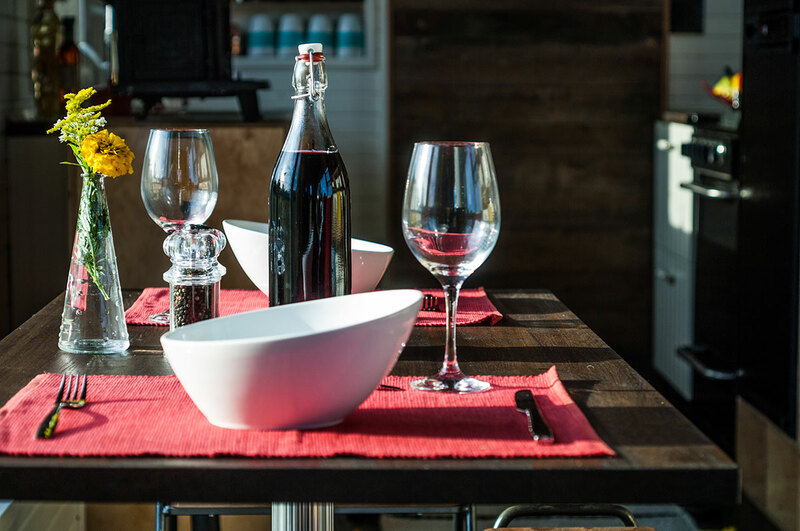 While the visual appeal of a tiny home is quite obvious, there are a number of other noteworthy benefits that can be enjoyed when living in a tiny house. Vince Marzilli is a master woodworker based in Orono, Maine. 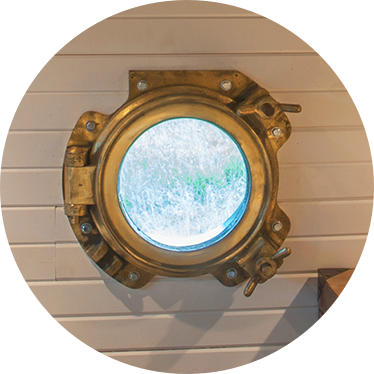 He has been a carpenter since he was 15 so it won't come as a surprise that, when he started building tiny houses, he created this bespoke work of art. Through the design phase, we consulted with experts on solar systems and rain-water catchment and with two architects who specialize in the green living space. As the build began, we walked this path with excitement and enthusiasm and then, at one point there, we were running down the hill completely out of control. The more we built, the more ideas we had. 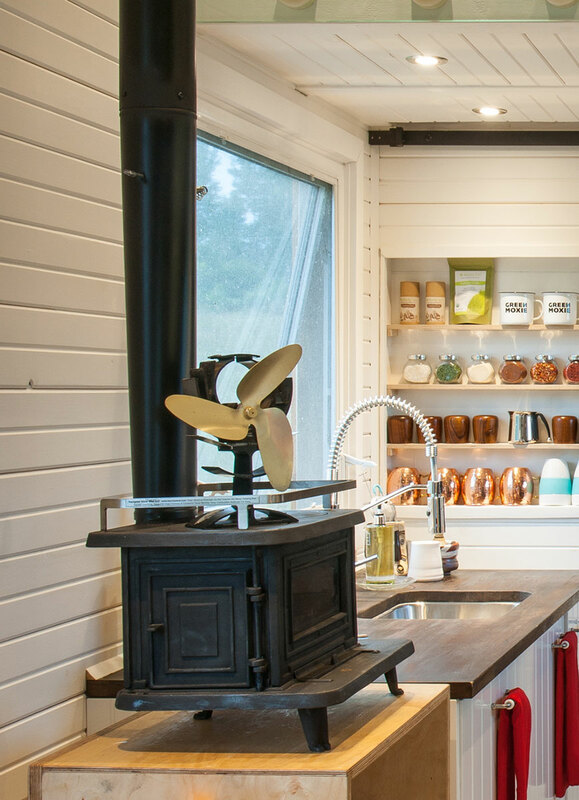 We put all the things into this mighty little tiny house. 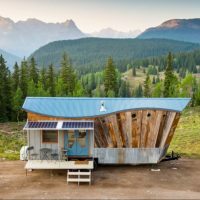 And while we blew our budget to smithereens, what we ended up with is the most beautiful, functional, innovative green home that is completely off-grid. This baby has it all (even the kitchen sink) and is ready to be lived in—a turnkey solution to any housing crisis you may be having. 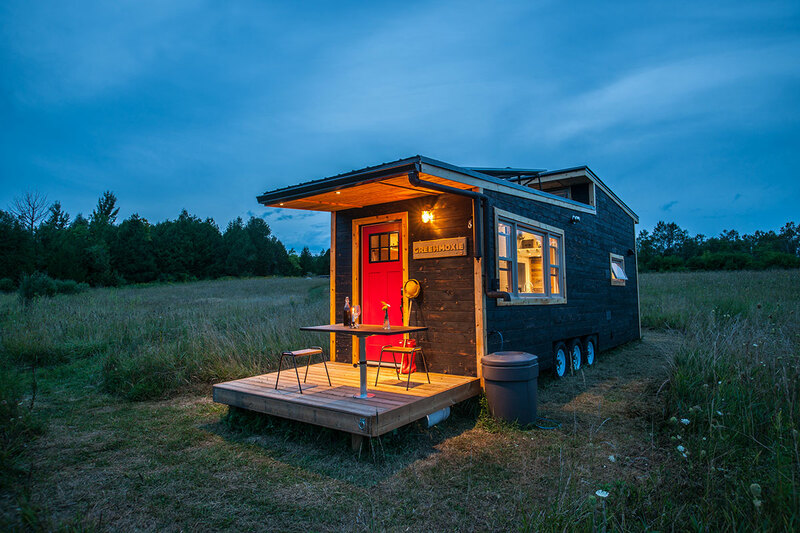 Whether you want to live in this beauty or use it as a holiday home or Bunkie, the tiny house is the panacea to high housing prices and small spaces. 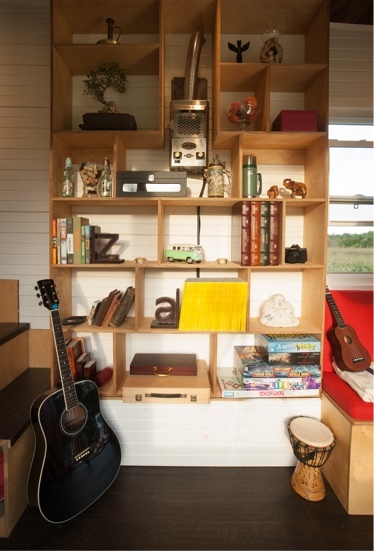 The idea for building the Greenmoxie Tiny House started with David and quickly inspired the other members of the team. 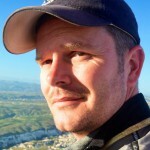 David is an obsessive entrepreneur with interests in advertising, publishing, renewable energy, and sustainable business models. 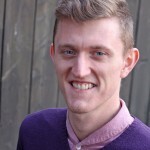 As an advocate for green building, Ian will be designing the house, drafting the plans, and making it as eco-friendly as possible while maximizing our resources. Contact Ian. I will be documenting the entire process and sharing our day to day activities as we build the tiny getaway. I will also help out by holding boards, swinging a hammer, or whatever needs doing. Doubt I can afford it but it is awesome! What is the price? It looks great; but, it also looks expensive :-(. Hi Glen, this is a great size for 1 or 2 people. 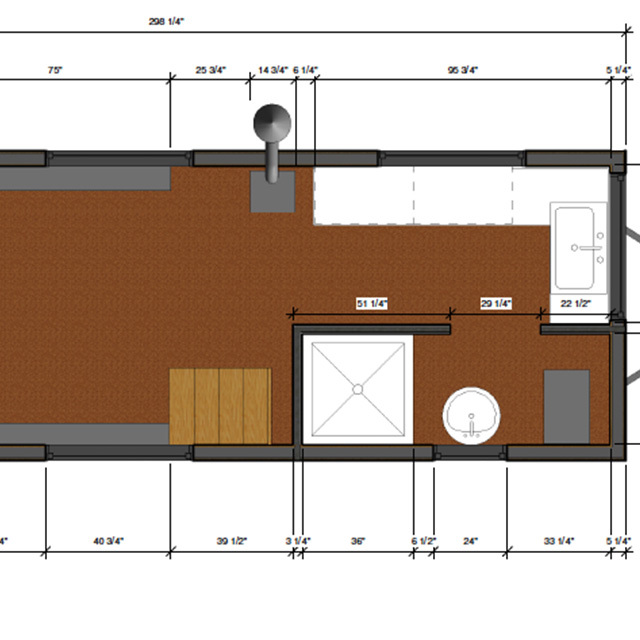 And yes this will probably not be our last tiny house. Thank you for your service. Where are you located? I’m guessing north of Toronto. Is it possible to see this home in person? Would you be able to ship a home to San Diego? I’m looking for a home to add onto our property instead of adding on. Also, how would this home do in the extreme heat of summer here? Is there any plan for heat? I love the design of this! What are the necessities for installation/ hook up? Maintenance? How often do you have to empty sewage system etc? Love this design but I’m in Australia so building it for me would be a problem . Are the plans accessible and what would they cost? Great Job, well designed, nice pictures. Will you be making blueprints and construction plans and resources available at good prices. I’d love to see short informative videos of each stage of construction. Also be sure to include the technical systems like solar equipment, panel, batteries, PV panels, 1st flush diverter, filter system etc. in the video tour please. I’ve been looking for months and your design is far and away my fave. I’d love to purchase plans! PLEASE! Hi Stephanie, We are working on plans package. I will keep you posted. Bob Kramer here in Pebble Beach. It is my understanding that since the Green Moxie is on wheels, it would not be assessed as a permanent improvement to my home….is there any precedent for that. We have a location for the Green Moxie but it is NOT accessible by road. So my question is, can it be built on site?? Would be very interested in purchasing plans with specs when available. Thank you for sharing such an innovative design for living. Hi Bob, Thank you for your kind words. 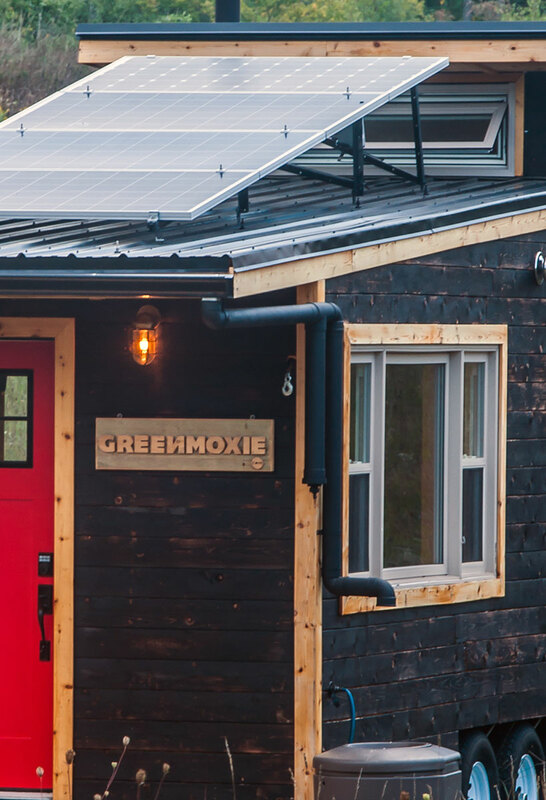 Although a trip to Pebble Beach sounds like an awesome idea, it’s not really practical as it would take several months to build you a Greenmoxie Tiny House. I think the best we can do is sell you plans which we are currently working on. I will put you on our mailing list and inform you as soon as we have them for sale. Kudos. I have a permanent tiny home with many of these same features and appliances and I’d like to think that it’s one of the better designed units out there. I love what you guys put together there… knowing what some of that cost (holy cow are those toilets pricey!) I can understand why you blew your budget. But it came out great. Wishing you the best of luck as you venture into production! A video tour would be much appreciated! Great tiny house! Well done. The truth is this is a prototype and one of a kind at the moment and we haven’t thought much about pricing. It probably cost us more than it should have because a great deal of this build was a learning experience. This unit is more on the luxury side and would fetch a premium. With the options listed I would think If we were to sell this unit it would probably be around $75k US. I’d be very interested should you sell this unit. I am on your email list, will that be where you post it? 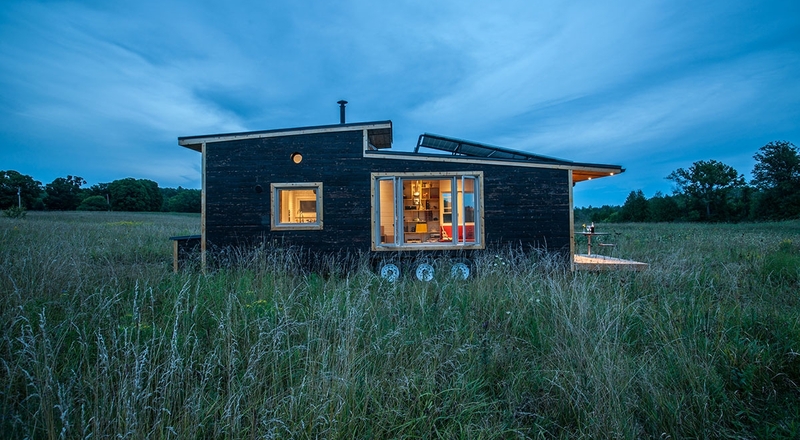 I’ve been following the Tiny House movement and receiving Tiny House Swoons for years. Your project is one of the most impressive I’ve seen yet! Please include me on your email list…I might soon be in the market to buy or build a Tiny House and begin the off grid lifestyle! I would LOVE 2 c one in person.As far as I know,no one is selling here in Pa.
HI Martin and thanks for asking. Unfortunately the shipping costs for an entire house would be prohibitive. We are in Ontario, Canada and we custom-build them here for our Canadian clients. The width is 8.5′ and the height is 13.5′ which is the legal limit for the road in North America (the chimney would have to be removed for transport). We are a small business which makes these individual bespoke tiny houses for our clients, so financing is not an option for us. The house weighs approx. 12,000lbs. Hi Rebecca, you would need a truck that can haul 12,000lbs. All manufacturers make a pickup that can do this. And yes the house is licensed for the road, it is classified as an RV (recreational vehicle). Quite an item. Living in such in winter seems like it might really be a bit clostrophobic. I’m a Chicagoan so I’m familiar w/cold and snow. But, imho, this beauty would be wonderful where it stays relatively warm. Do you have a picture of hitch or of it hooked to a vehicle- what’s the total weight? Hi Ron, the trailer has a pintle tow hitch, here’s a reference http://www.truckforums.com/forum/automotive-parts-sale-58/brilliant-trailer-hitch-utility-backup-light-idea-no-wiring-6981/ and the house weighs approx 12000lbs. I also would love to buy plans if you ever choose to share with those in other countries where pick up is prohibitive! Planning my first THOW and this one ticks every box! Is it possible to buy blueprints and DYI? Great work! I’ve been working on a design for about 9 months, that is very similar. I even have a retractable deck on my plans, lol. I have my trailer (24′), but I broke my leg mountain biking, so I have to wait to start building… Thanks for sharing this! Good Luck! Looking into purchasing a tiny home or yurt for my family. My SO is well over 6′ tall–about how tall are the ceilings in the living room, shower, and sleeping areas? Looks beautiful!! Hi Dave! You guys are the first ‘tiny home’ builders ive found in the province! AND SO CLOSE TOO! 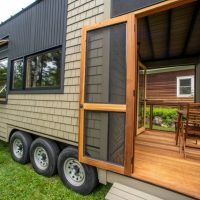 I too have been bitten by the tiny house bug, currently working on changing my ’94 Rockwood 5th wheel into a small self contained home for myself. Ive been toying with the idea of adding a loft, my question is what would your advice be on the maximum height of a loft IF one was to add a loft to an already exsisting 6’5″-6’6″ over the goose kneck area? What a great TH! I love what you’ve done! I probably missed it, but how much would this cost with everything here? Can you send it to Arizona, USA.? How long does one take to build? Would love to hear from you! What about the “cost with everything here” part of her question? I would like to know, too. I’m in northeastern US. Hi Erin, pricing can range from $65-75k US depending on the options. 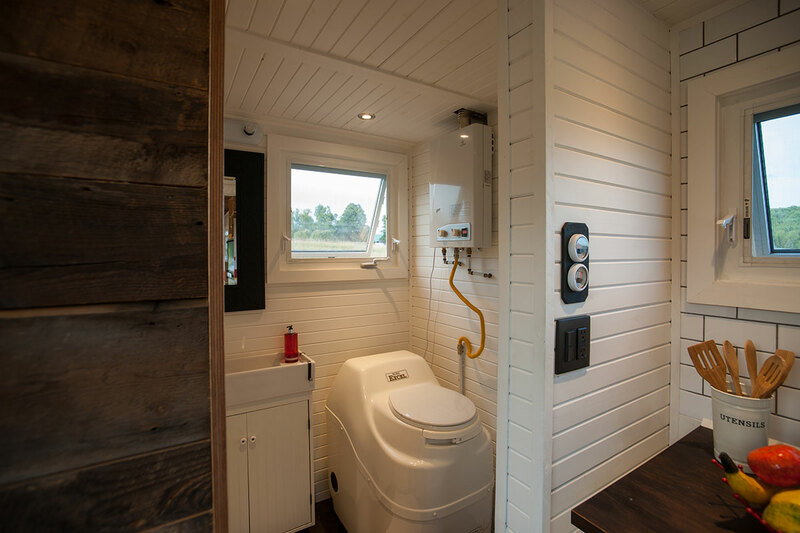 Our show model has some up-cycled/recycled components, like the windows, the barn wood, the composting toilet, and the refrigerator, the brass portal & light fixture. Kijiji was truly a goldmine for this project. For example, the windows were obtained from a local salvage and we scored them for only $650, they are less than 3 years old and in perfect condition. We priced the windows new, and they are worth almost $10k with tax! So our philosophy is that if you’re prepared to accept recycled or up-cycled components, this can reduce the build cost considerably. This can also make each build a little different (or custom) because we have to work around salvaged items that may not be exactly the same dimensions each time. On the plus side, this makes each house unique like you. I hope that answers your question and many others who have asked about cost. This looks amazing! It’s got swag and elegance all at once !! 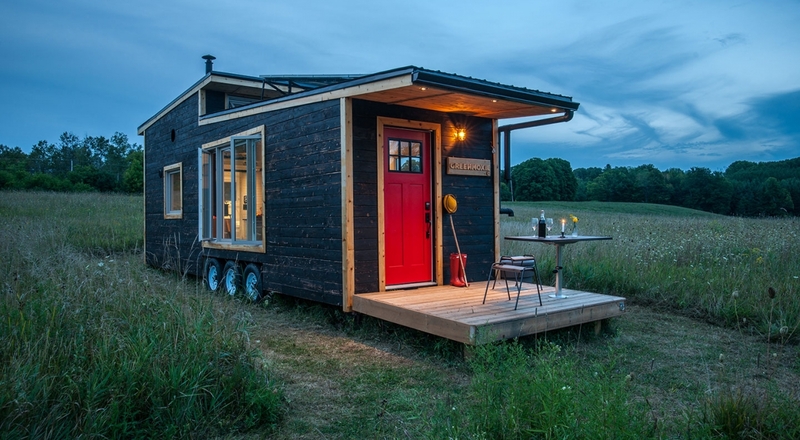 This is something I’d love to own !❤️ Is it possible to get my tiny home outside Canada ?! We could deliver to the north east but we would need to look into the implications of selling across the border. Is this still for sale or have you sold it? Love, but the one thing that I question is the lack of a railing on the stairs. Total paranoia thing for me – fell and broke ankle a few years ago. Is it possible to include without ruining the look? We left these open to encourage the feeling of space, but of course you can add a railing and may need to do that if your local building code demands it. Let me know when one is available. I have a 5-year projection need. Thanks & great job! It’s perfect! This one is available now and we do custom orders for clients, so you can order one for when you are ready. How do I buy one? My fiance and I have been looking for something exactly like this. I already emailed you guys asking for more info. We are getting married in April and will need one around then. Is that feasible? 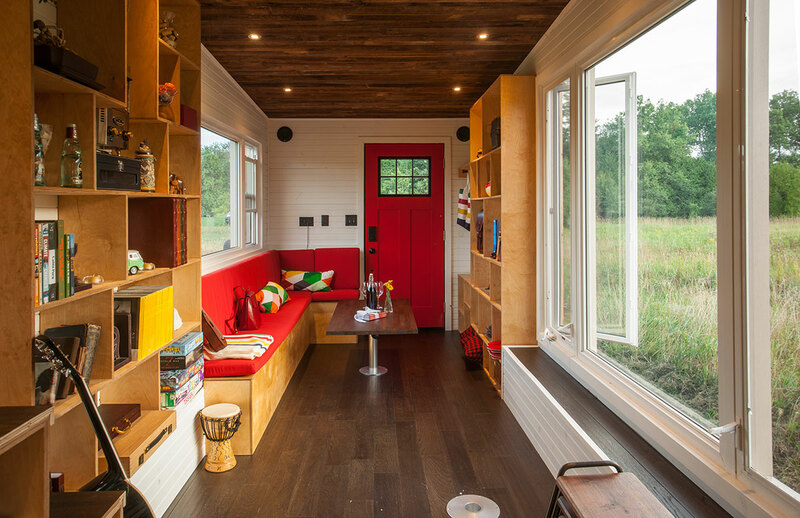 This tiny house is in Ontario, Canada. 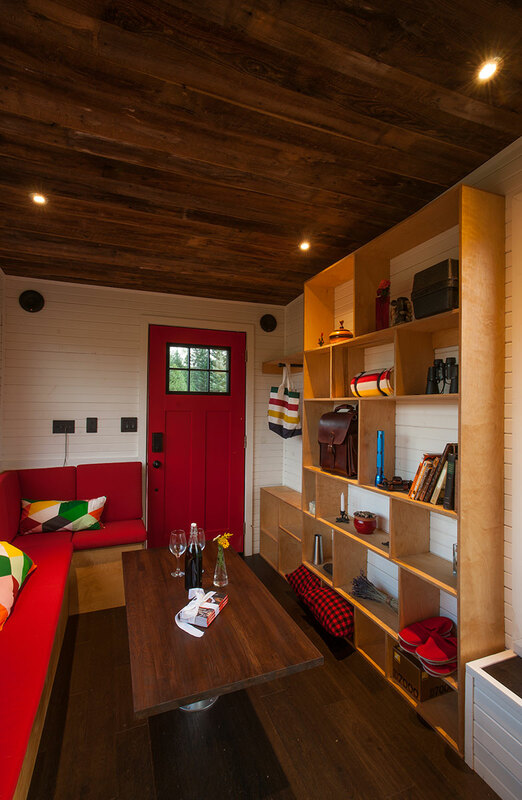 We make custom tiny houses so we would be happy to make you one too! 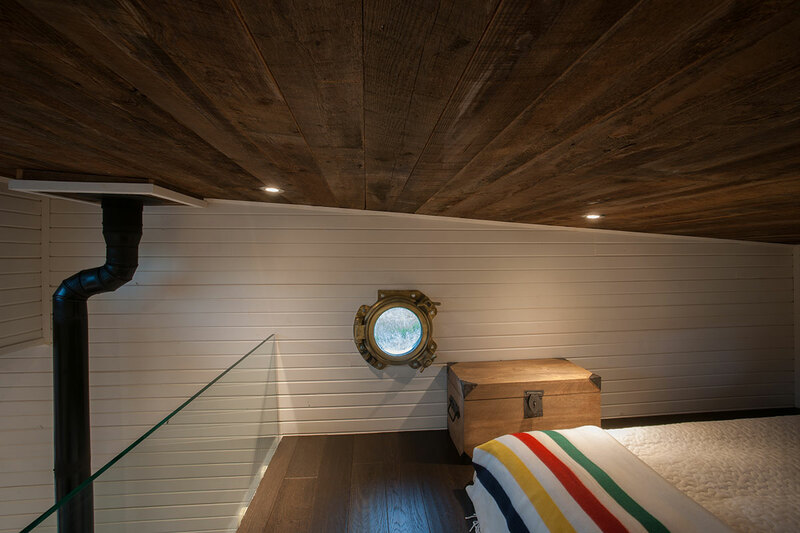 Obviously, shipping a tiny house would be prohibitively expensive, but if you live in Ontario, drop us a line at [email protected] and we’d be happy to help! Congratulations on your upcoming marriage! I’m not really familiar with all of these off-the-grid utilities and what it takes to keep them running, do you know roughly about how much it cost’s monthly or yearly to replenish the propane, batteries, etc. Hi Phil, The batteries should last anywhere from 5-10 years depending on how many charging cycles they go through. Propane will likely be about $30-50 a month depending on your use. Does it really weigh 10 tons? Great job on the Tiny House guys! Really beautiful. Wondering if you could come up with a design (maybe custom) to accommodate another sleeping loft? Hi Brett, Thanks for the compliments. We have another design that we are working on that has a double sloped roof that meets in the middle and allow for 2 lofts. We’re working on new designs and plans and hope to release them early in the new year. As a Holistic Health Practitioner /Urban Farmer/Life & Spirit Coach, I am currently fulfilling my life purpose in service to others for better health solutions. Since the beginning of time,( just as with your Green Moxie Tiny Home) the Earth has sustained man kind supplying all we need for good health and happiness. Over the past 60 years, the food industry around the world has become a money making machine that uses the American government funded commodities such as corn and soy in all processed foods which is a direct connection to Disease and illness around the world. It is my purpose and mission to educate people of the earths healing medicine (FOOD) & (HERBS) that has been a gift from the Universe for all people and educating others in making conscious life style changes that can give them good health and happiness will be the result. I have been spending much time in prayer and know I will be traveling in a Tiny Home to fulfill my life`s purpose and I wondered if your company has ever considered connecting with a person such as me who will lead by example and share this information using your Tiny Home as a model for others to copy. I am putting this thought out to you as the Universe has encouraged to ask for what I need to begin my traveling mission and so it is. In the mean time please be very proud of your model home for it can truly be an example to the world of how to get back to the basics and leave all the material world and stresses behind to gain good health and happiness once again for many years to come. The next generations are depending on us to lead the way and so I commend you and your home for taking that role on and show casing sustainable living. 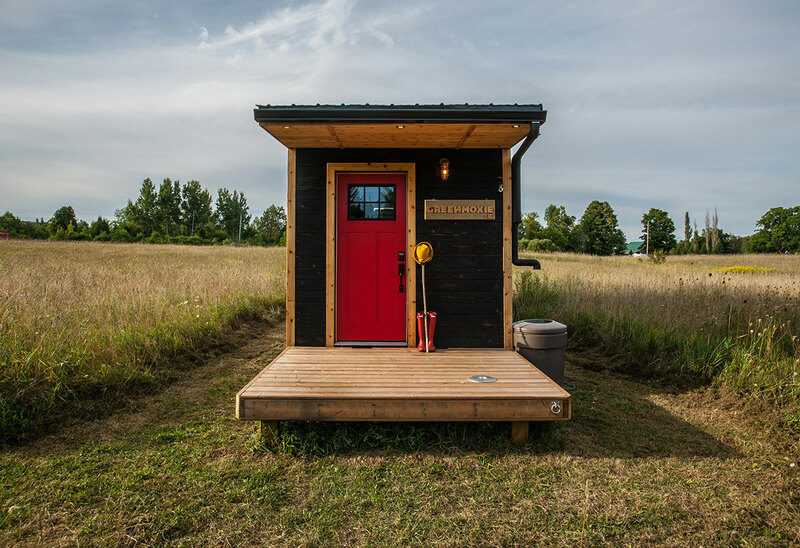 Have you also ever considered creating a Tiny Home community where all life in these Tiny Designs and share their food, livestock, and green living practices to improve the current devastating direction our world has been leaning toward. Together, we can make a difference in the lives of others. I say let it begin with us! Could a pellet stove fit into the wood stove space? Also, please put me on the list for plans. Thank you. 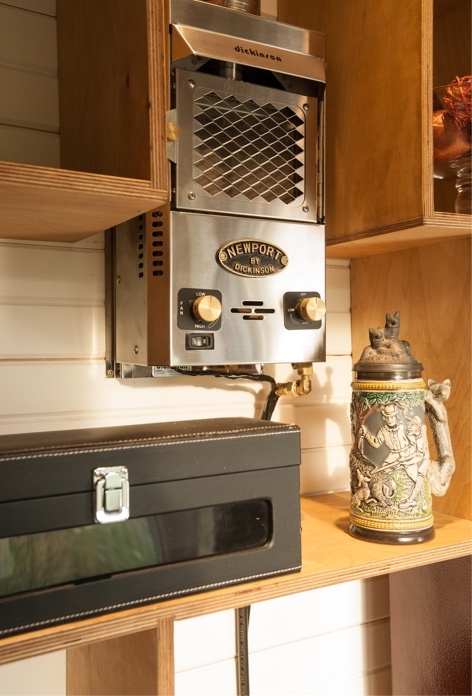 A pellet stove could easily be installed in place of the small wood burning stove. I will caution you that the tiny stove throws a lot of heat and is rated for 500 sq-ft, anything larger would be unbearable at night for sleeping. I will add you to our email list for plans. Great Design! Have you considered a version with a bed(room) on the ground floor? Many disabled cannot navigate stairs. Good point Chuck. We make custom designs suited to the customer’s needs. This house was for us, so we wanted to have the view that the loft afforded us, but we can alter it too. awesome design and layout! I’ve read most of these comments and i read that it might be possible to ship over the border to north west of US ie California. What would the shipping cost to have it shipped to California? Do you have any videos of the deck being raised/lowered or how it is done? I’m interested in how you have the Superwinch configured to raise/lower the deck. ie. does it require one to hook/unhook a cable, etc. I would like to do something similar possibly using the side of a shipping container, but don’t want to have to hook/unhook cables or have pieces on the side that could accidentally be tripped on. Looking for something like a “one button” up/down. The cable is recessed in the wall and we simply use the power winch to unwind the hook and cable and then connect it to the eye on the deck and power lift it up and same to lower it. The winch is hidden behind a small door on the side of the house. What do you do with the grey water and where is the tank located? Great looking and self sustainable, it doesn’t get any better than that! I would love to have one of those here in the southwest so please put me on your email list for plans. Best wishes in your new designs. Love love love this house! We have two kids though… any chance you could fit couple of wall folding bunkbeds or something similar in it? Wow! So great! Just wondering why you couldn’t drive up there from here (Washington state) and haul it home? I would love to be on a mailing list for all your future work! Thanks! Damn skippy you can! It’s ready to go! 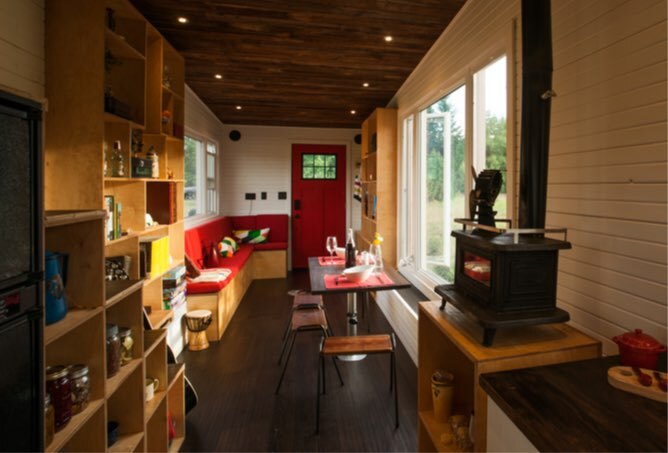 I am completely in love with this tiny house. Are the plans available for purchase? I LOVE this home! Love the fact it is self sustainable! Could you put in a Japanese soaking tub instead of the shower? Are the plans for sale yet? 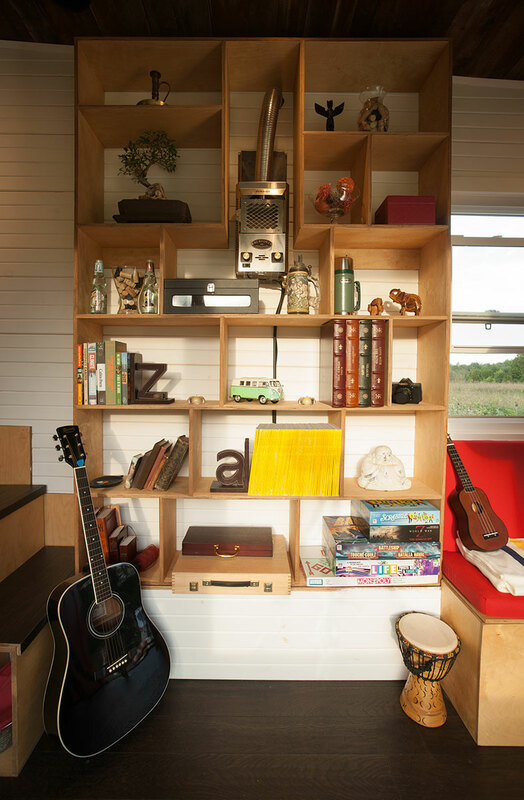 All tiny houses are completely customizable. Are the plans available yet? I’d also be interested in the plans if they’re available! Gorgeous siding! How does the color age with time? Does it lighten? Get silvery? Did you apply a sealer? In the year that we have had it, it hasn’t really changed color. We sealed the siding with linseed oil after it was charred to seal in all those oils and protect it from the elements. I am told that it will silver with age like great old barnboard. Hello! Are the plans available for purchase yet? 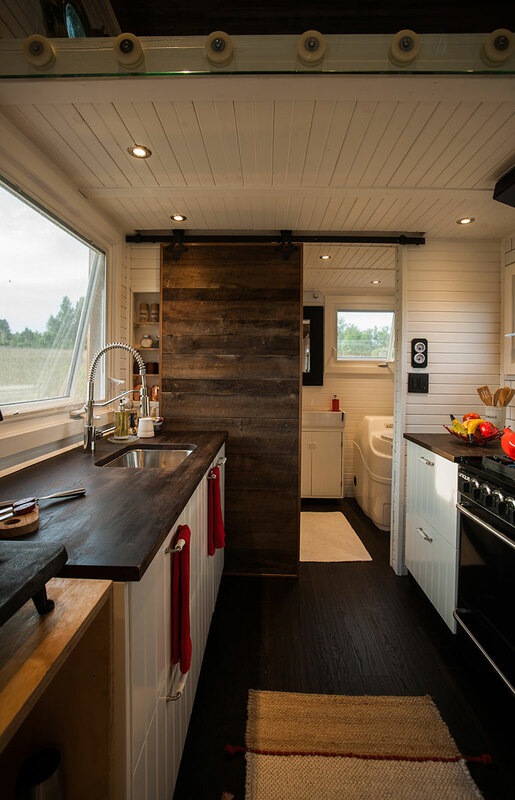 We love the design and are planning to build our own tiny house, very similar to your layout with only a few adjustments. 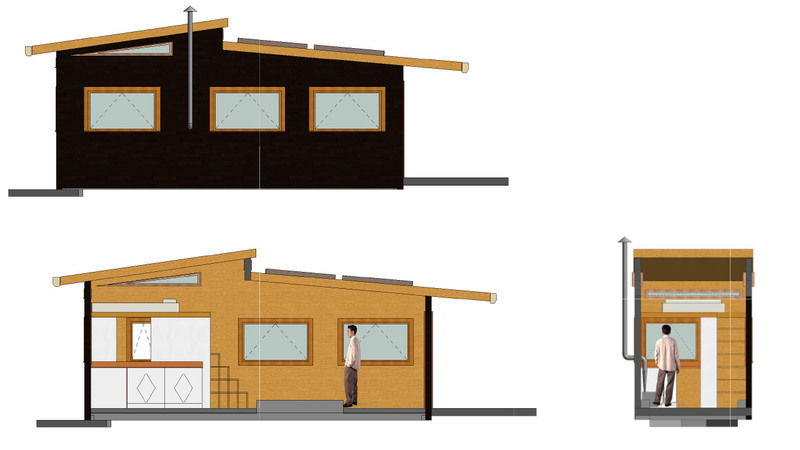 The plans are not available yet, but we are having a tiny house workshop in July. You’re welcome to come over and take a look at the tiny house and learn some skills while asking all the questions you like! Will you in the future or do you currently do additions such as the loft room adding floor storage? If you are in ontario, we can help! 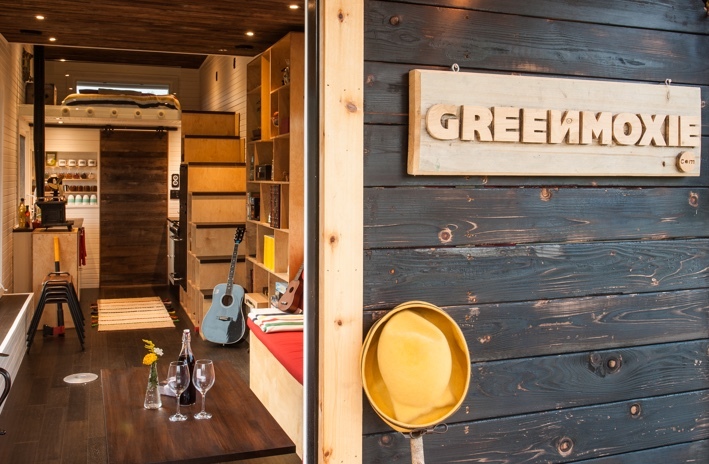 Very impressed at the features and love the look of your Greenmoxie Tiny House. 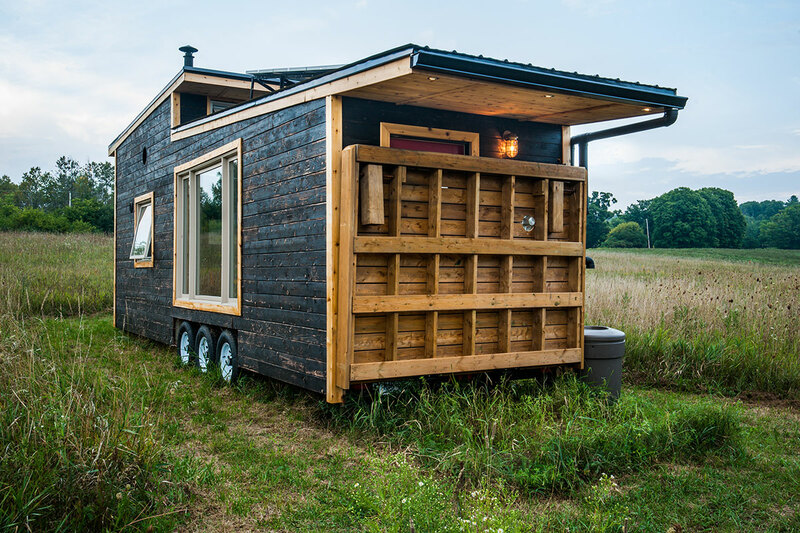 Do you have dates already set in July for your Tiny House workshop? Please let me know when you make plans avail for sale. We’ll have those dates for you before long. I’ll send you a message when they are sorted. What is the build timeline. I’m looking to move to the Santa Fe area early 2018, and would like a Greenmoxie as my primary residence. I read in an earlier post I’d need to use a third party for financing. Are there specific terms you’re willing/not willing to accept (down payment amount 20% etc… )? I am interested in purchasing one of your fine homes. Can you please send me details on cost, financing and add on options? How could it be adjusted for tropical climates? 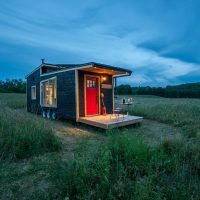 Im interested in tiny homes & haven’t determined to build or purchase. I do like your design. I just saw this tiny house driving down the 401 East, near Kingston!!! I have had this one saved in my favourites on Pintrest for months, so I was overjoyed to see it. I had no idea you were Ontario based. Very much hoping to attend your workshop this month, are there deatails for that yet? Could we possibly drive out to you to pick ours up, should we purchase one? My partner and I are in Oregon. Yes, our last customers drove out and back from Vermont and they had no problems. I love this. Could you add another bedroom to the other side? And maybe make the sitting area pull out beds? Can this be purchased? Thanks for your time. This particular model has been sold. We do custom-make tiny houses for customers. A bedroom on the side would only be possible if you took it off chassis, but there are so many different plans available, that I am sure you will find one you like. Where are you based? I am in Alabama. Could you build one just like this one? 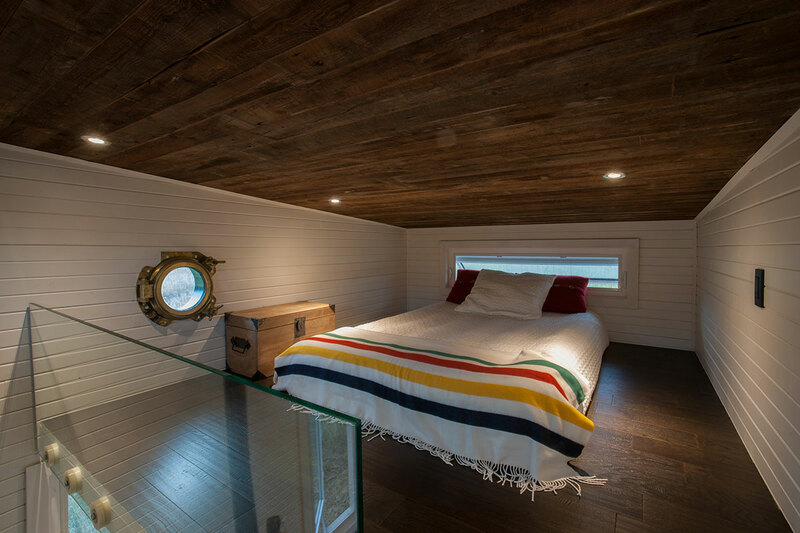 I mend a bedroom exactly opposite of the bedroom in this tiny house. Where can I see plans of tiny homes. I want a self sustainable tiny home. Thanks for your time. Thanks so much for the inspiration. Would love to see you all at the Jamboree in Arlington, Texas this October! How would one purchase one of these? How long will the battery last without any sunlight on average with normal house usage? What is the battery runs out, can a back up power system be installed? How many gallons of water does the roof storage system store? Does the filtration system filter the water caught on the roof? If I run out of water, how to I fill up the water storage for the house? Is it legal or park on an empty sidewalk overnight with this or is is required to only sleep at camp sites with these? This system will provide 20 hours of power with normal use. We have a generator for days when the sun doesn’t shine, but it is also possible to install a bigger battery bank for longer use. A filtration filter does clean the water from the roof. We have never run out of water, but you can just fill it with a hose. 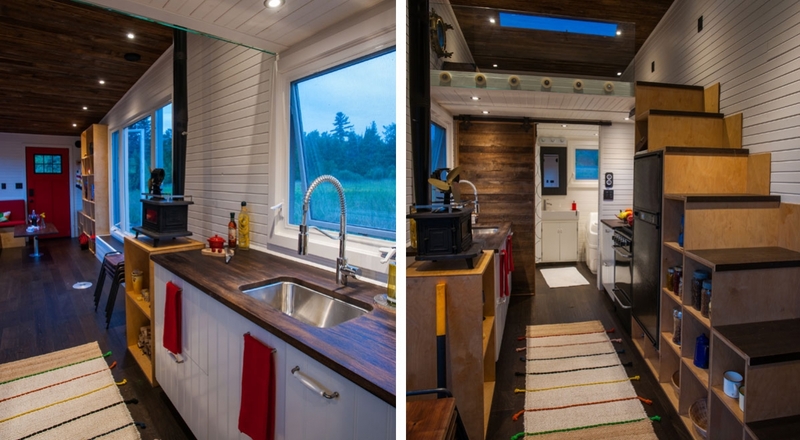 Tiny houses, while mobile, aren’t meant to be trailers. They are generally used as permanent structures. They are on chassis so that you can move them if you have to but mostly it is so that you don’t have to get building permits. Tiny houses should still be built to code to ensure occupant safety. 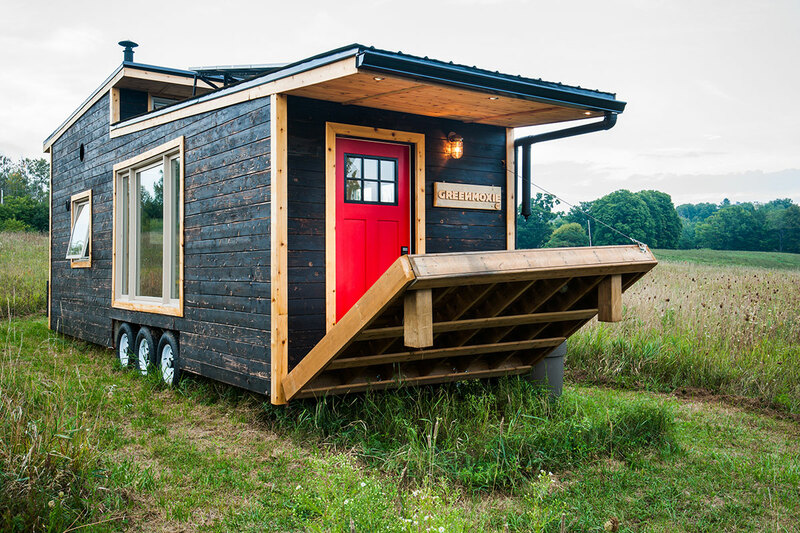 Not all municipalities are open to tiny houses. Some welcome the move to sustainability while others require a primary residence on the land. I suggest you contact your local planning office to see whether tiny houses are welcomed in your area before you proceed. thanks so much for your comments. My plan is to travel across the country with my girlfriend and I for one whole year across the USA. I’m looking for something that would be safe for travel, solid construction to prevent intruders from breaking in, something that I could use sustainability features as well such as solar and the ware filtration system with back up generator, etc. Do you know of anythingn like this that might be better suited for my upcoming trip? I welcome all idea…I’m desperate to finds something that will work as I dont want to rent a hotel every night! Are you based in Toronto? 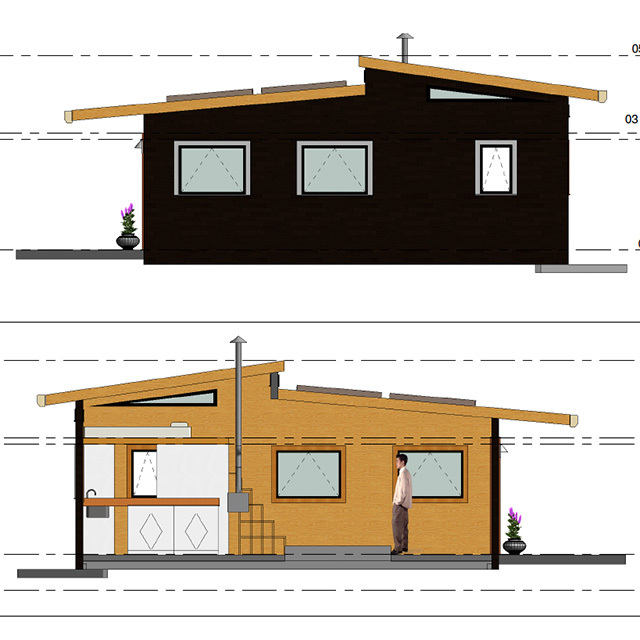 My wife and I would like to build a tiny house with you guys. How do we contact you? Do you have a website? Hi there, this is my website. We are just outside of Toronto in Warkworth, Ontario. You can contact me at [email protected] and we can talk tiny! Are you accepting deposits on new builds? Yes Jane. PM Me at [email protected] with your specs and I’ll send you a quote. I may be interested in this home for a farm in Kirkfield ON. I totally love it! Wondering how difficult it might be to get it where I need/want it. I am guessing you don’t do onsite builds. Either way I am not ready to go any time soon but would like to be in contact and on a mailing list to keep in touch. I would also want to tweak a few things to suit me personally. Also are you selling plans yet? Hi Cathy! The homes are built on a chassis and are really easy to move. A truck or van should be fine. We have had clients drive them to new locations up to 10 hours away with no issues. Each home is made to the customers specifications, allowing the client to determine the price. I’ve been wondering about washing machines in self sustaining homes. Any suggestions? Hi Cindy, we don’t have a recommendation as we haven’t tried a bunch out, except to say that Energy Star appliances would use less energy and that’s what you want! Looks interesting, but I don’t see the dimensions for elevation. Is this design suitable for a tall person? I am 6 foot 6 inches tall and don’t want to have to crouch. Hi Lee, there’s plenty of room! The high ceilings mean you have no trouble getting around, even in the bathroom. There’s good clearance. The only tight space is the loft bedroom which does not have standing room, but since you’re only sleeping in it, it’s not something that bothers me. Hello, I was wondering, how many windows there are on the side where is a chimney? 2 or 3? because photo shows 2 and on a diagram there are 3. We really appreciate the design. We were curious if it was insulated and/ or if you had any data on its ability to retain heat at low temperatures (0 F)? Yes, there is spray foam in the tiny house as we live in Canada and it gets really cold here in the winter. I find the house is able to retain it’s heat really well. It is only heated by a small wood stove during the day and occasionally by a gas stove after we have gone to bed. It takes very little to heat the small space and it works really well. Winter temperatures here go down to -25 C to give you an idea. Where did you source your range vent? Did you vent the bathroom? The range vent comes from an RV supplier because we needed one with 12 volts. The bathroom did not have an extractor fan but one of the two HRVs was in the bathroom and the window was operable. 1 kW is nothing. The average single person require at least 2 kW to live on. Large kW solar panels also offer better value for the money. The stove and fridge run off gas so it’s more than enough to live on. We have no issues with power. We have a backup generator, but have not had any reason to use it. 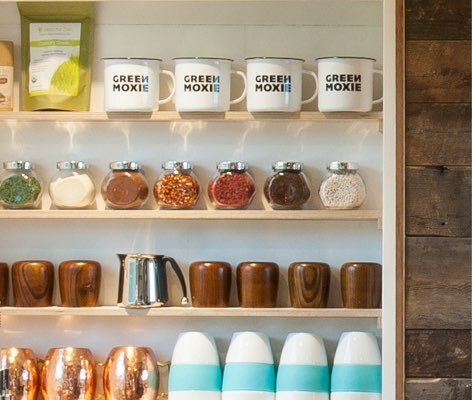 I want to own a Greenmoxie! 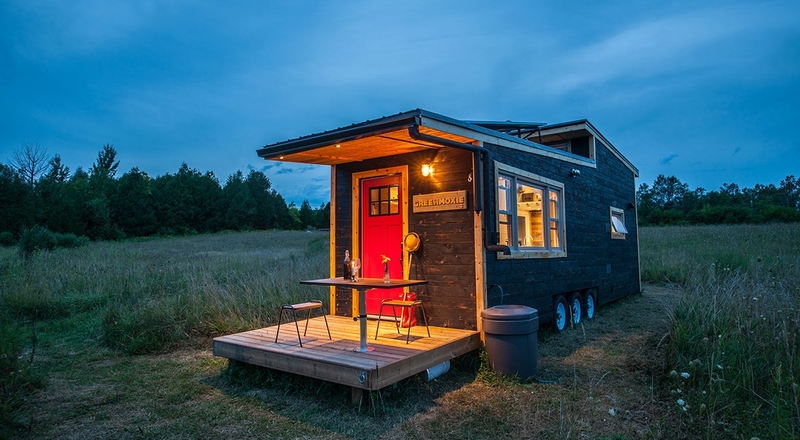 I have been researching Tiny Homes for 2 years and this is the one 🙂 What is the timeline for hearing back about an inquiry to have one built? Also, do you all offer financing or would that need to be through a third party? We don’t offer financing, but please pm me to [email protected] with your requirements and we’ll be happy to send you a quote. I’m interested. I’m interested in water/ sewage treatment and disposal. Thanks. Hi Taig. 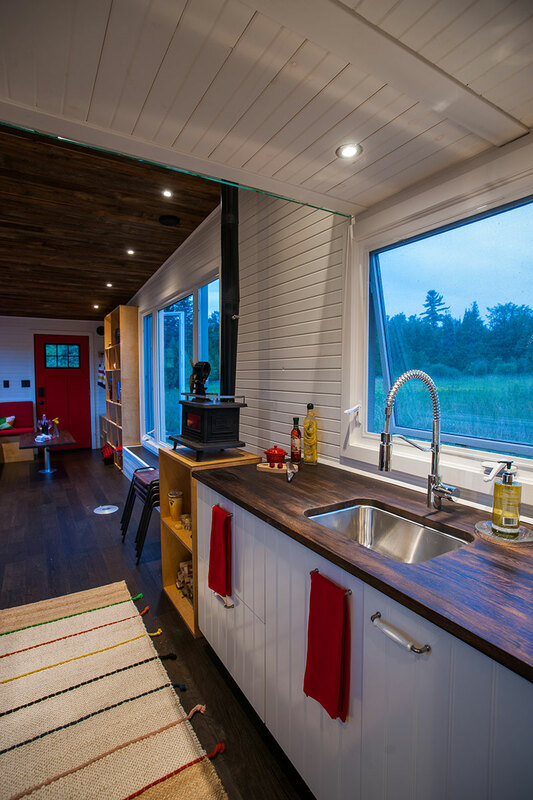 Message me at [email protected] and I will be happy to answer any questions you have on the tiny house. Hey guys I sent you a message the other day. I would love to buy one of your beautiful homes, cash. Please get back to me when you can. Best regards, Alex. I don’t have an email from you. Can you please resend to [email protected]? I am interested in purchasing one of these homes. I’d love to hear more about the costs and the options. Hi, we publish MONO magazine in Tokyo Japan. 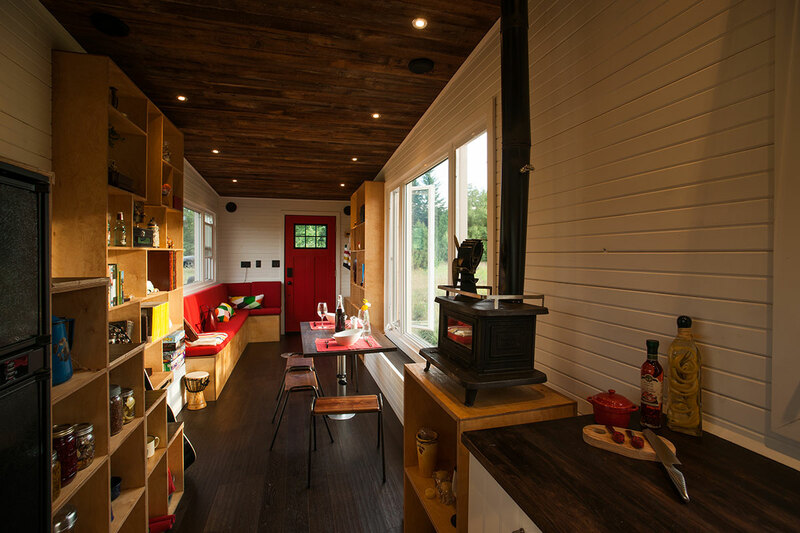 We would like to reproduce the Greenmoxie tiny house in our mono magazine, coming out in early June. 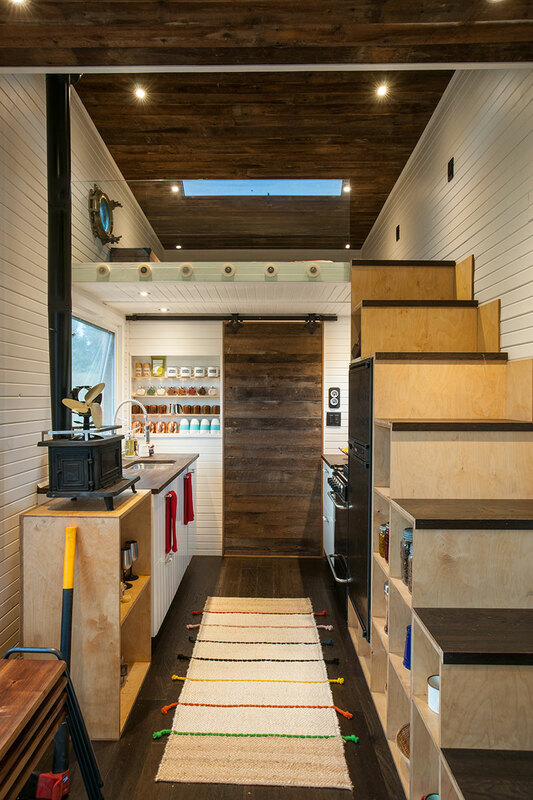 Can you give us permission to use one of your photos of the Greenmoxie tiny house as featured in your website? MONO magazine is published bimonthly in Tokyo, in Japanese launguage. Look forward to your reply very soon, as we would like to have a high resolution photo (to be used in double-spread) by Monday next week, which is 21 May. Yes, that would be fine as long as you credited the photographer and Greenmoxie. Thanks so much. Would it be possible to get a copy? We do build custom tiny houses. The cost and timeline will therefore depend on your requirements. Please drop me a line at [email protected] with some ideas and we can put a quote together for you. Love this. Is it possible to have 2 lofts? What about delivering to North Carolina, US? Also, could you give a quote? yes you can have two lofts. I can give you all the details if you send me your list of requirements to [email protected] as well as where you live and what your timeline is. Thanks! I live in Boston, MA and while very early on in my research and ability to move forward with this process, I was wondering how to best begin working with you? I’ve fallen in love with your design, but after a year of completion the plans are still not available, correct? I read all of the above comments and it seems there’s about a 4 month lead time for production? Is it best to get my ducks in a row with financing prior to working on plans? What are your price/size RANGES? Are there any specific “tiny living” resources that you recommend for people that are making this rather drastic life change? For instance, what’s it REALLY LIKE to have to deal with the practical issues of getting food, managing the toilet, etc? THANKS so much!! Our initial idea of selling the plans was shelved because there just wasn’t enough demand to justify the expense of having them drawn up by an architect. We also realized that everyone wants their own bespoke design so we tend to create new plans for each client to suit their needs. The bio toilets are really easy to handle and aren’t something to be concerned about. However, living in a single spaced unit is not for everyone. I would recommend finding a tiny house air BnB and trying it out. In terms of design, all of our units are custom so the build time is closer to 6 months especially since the trailer needs to be manufactured. Financing is not offered by us so you need to get those ducks in a row. Size is 20-30 feet and width is fixed at 8.5 and height at 13.5. Prices range from 50-100k depending on your requirements and size. That is totally finished and move in ready. Please email me at [email protected] with your request and I will pass you on to our builder. Is this available for purchase? If yes, how much and what is the wait time? We have sold this particular one, but we do custom make tiny houses. Depending on your design, the wait time is 3-6 months. Hi! Do you have a list of the companies you used for each of the materials listed? For example, we are wondering where you bought the water filtration system and your solar panel system. Thank you! warmest greetings from the frigid north! love this house,its perfect for me. I’m an old hippie with little tech skills,(by choice)!! could you please send me via usps, info,specs, and financing options. I think what youre doing is wonderful. Look forward to hearing from you! hi very interested in buying one how does that process work ? 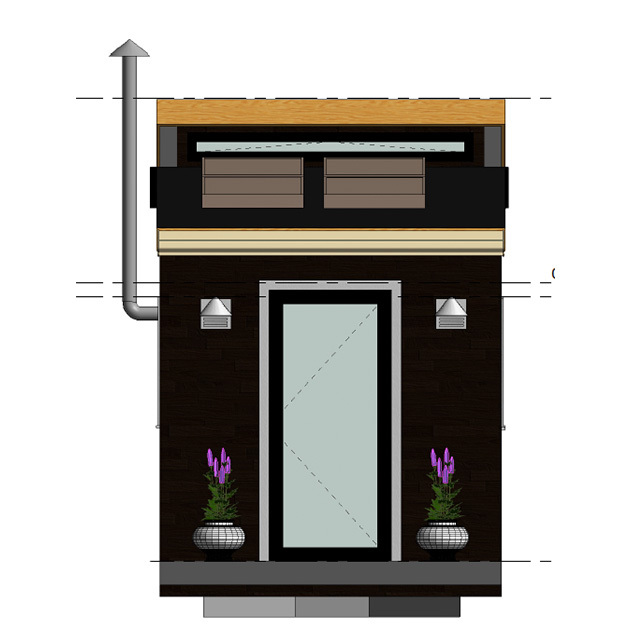 Hello People of Greemoxie.com, “The Greenmoxie Tiny House Project”, I like your model of the Tiny House in this webpage, and I would like to know if you already have Blueprints of this Project Tiny House available for sale. 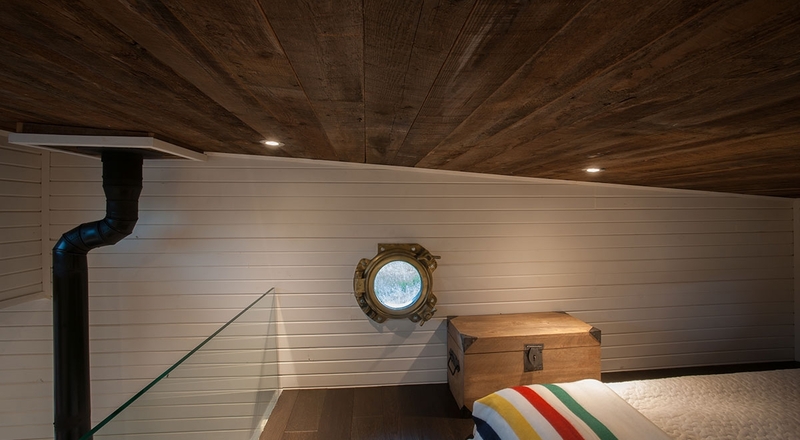 I am a senior citizen, living in Los Angeles, CA, and realize that you are located in Ontario, Canada, which is kind of a big stretch for me to drive up North and pick up this gem of a Tiny House, as such I rather embark in a “DIY” project by myself, with ample time and materials. I would appreciate if you can add my name and e-mail to the Mailing List (I do not use Social Networks), so that if, and when you have the Blueprints available you can contact me about how to purchase it. Thanks! Kind Regards, Isaac J.